There are many kinds of milk tea products being sold by these shops, of course, but the basic product is your average boba tea, Taiwan-style. Boba or bubble tea is basically just tea (either green or black) mixed with milk, sugar, and some tapioca pearls or bubbles. The drink is often served chilled and mixed with a few ice cubes to help keep it cool. 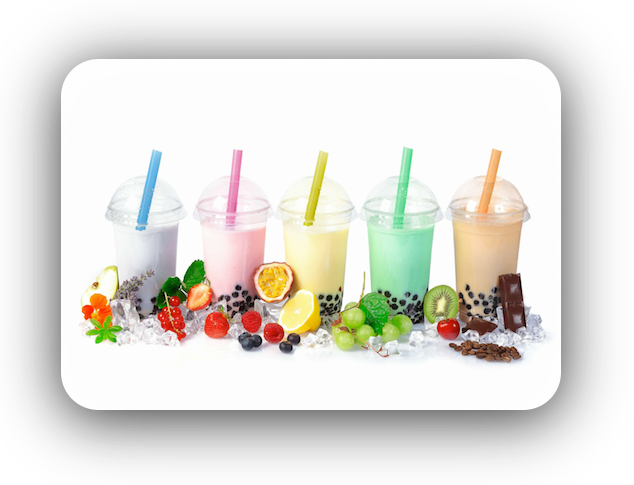 One can go from that formula established by the basic bubble tea product to create the other popular types of tea at these stores. The formula is simple: the tea is essentially your base flavoring, the milk is the creamer, sugar serves as the sweetener, and the tapioca pearls add a chewy element to the drink. Replacing one of these with another ingredient of the same type (e.g. sugar can be replaced by aspartame for the sweetener) can create a variation on the drink already. A popular variation is the fruit bubble tea drink. There are actually two sub-types of this that deserve individual recognition as categories of their own: the version that has completely removed tea from its ingredients, and the version that still incorporates tea in the drink. Both types are largely dependent on the fruit as the base flavor now, though, and they come in a lot of flavors indeed, from mango to mixed berries. The types that also have fresh fruit mixed or blended into them are particularly popular with health buffs. Another popular variation is the shake: instead of simply chilling the drink, the server blends it with chipped ice and creates a frosty, often sweet drink that is very popular in the summer. The addition of the ice flakes adds even more texture to the tea than usual, and other toppings are often added to it for extra interest, such as cream or froth. Finally, there are the specialty flavors and blends. Every major milk tea shop shall have at least one that it considers proprietary, and the experimentation is usually with the flavor element of the formula more than the other parts. The flavor combinations are often wild and daring, and just about anything – even lemons and on the truly wild end, chilies – can be fair game. Provided a tea shop owner has a bit of creativity and a good enough palate, he should be capable of creating signature drink that customers shall come back for again and again.